Get the BEST in tap water filtration. The 8-Cup Aquagear Water Filter Pitcher is proven by independent and ISO 17025 accredited labs tests to remove the most harmful but common tap water contaminants, including lead (97.5%), Fluoride (90%), Chlorine (99.99%), Chromium 6 (99.87%), Mercury (99.6%), Trihalomethanes (99.99%), DDT (98.8%). With the Aquagear Water Filter Pitcher, you can finally experience total peace of mind and keep your family protected from tap water contaminants around the clock. The pitcher's long-lasting filters (150 gallons) mean less hassle and more savings over the long term. Best of all, it comes with a LIFETIME GUARANTEE, any defect or breakage you have with the filter pitcher will be covered by us. 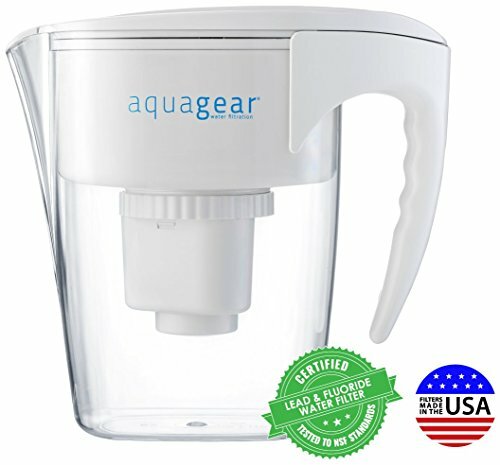 Experience cleaner, healthier and fresher tasting water with the Aquagear Water Filter Pitcher. If you have any questions about this product by Aquagear, contact us by completing and submitting the form below. If you are looking for a specif part number, please include it with your message.